Pomegranate Catering provide high end catering services across Kent. Their existing website had been built for them a while ago and they felt it no longer reflected them well and it didn’t generate a lot of business for them either. They wanted a completely new look, so we started with a logo design before working on a new, sophisticated but friendly design that would emphasise their four main services. The design focuses on their excellent food, utilising their many great photographs with large image banners to make you feel hungry! The site features a custom built menu system that is very easy for the to update, along with a blog and is a custom WordPress website so it is easy for them to update as well. 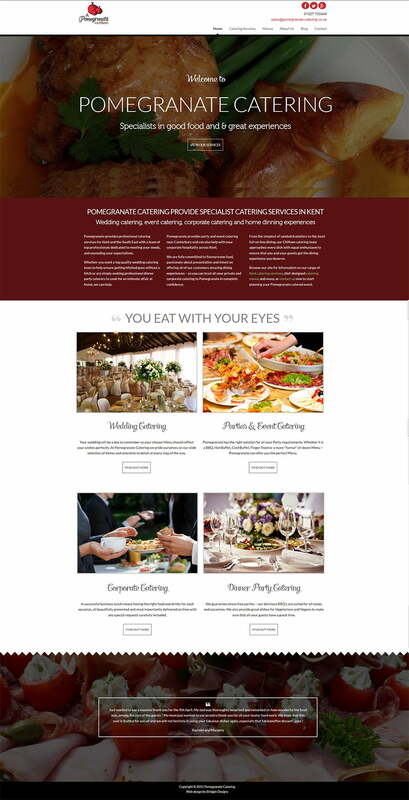 We want to thank you for the great website you have created for Pomegranate Catering. Two days after the new launch we receive already very positive feedback about the design and the whole set-up of the site. You have captured exactly the spirit and USP of our company – all after a very short consultation. You have analysed our business based data and brief given in a perfect way and the result speaks for itself! We will use your services in the future and look forward to a great co-operation!